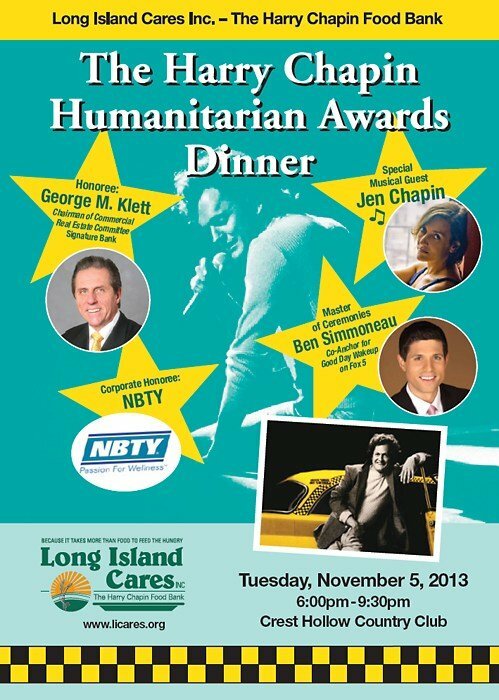 Woodbury, NY - September 17, 2013 - Long Island Cares, Inc. will host it's annual Harry Chapin Humanitarian Awards Dinner on Tuesday, November 5, 2013 at the Crest Hollow Country Club in Woodbury. This year's program is shaping up to be another exciting and successful event given our honorees and talented guests. GEORGE M. KLETT, Executive Vice President and Chairman of the Commercial Real Estate Committee at Signature Bank will receive the Harry Chapin Humanitarian Award for individual leadership and philanthropy. Mr. Klett has been a recognized leader in the Real Estate industry since 1975 having served in various executive roles at Fourth Federal Savings Bank, M&T Bank, and now at Signature Bank. A member of the Real Estate Board of New York, The International Shopping Center Association, and The Lincoln Center Real Estate and Construction Council, he and his wife Joyce are involved in numerous charitable causes. Because of The Klett's generous support, Long Island Cares will expand it's mobile outreach services to veterans and military families this coming October. NBTY, INC. will receive the Harry Chapin Humanitarian Award for corporate leadership. NBTY has shared its success by generously supporting the local community through charitable contributions to worthy causes all over Long Island. The mission of the Long Island based corporate leader in the nutritional supplement industry is to enhance the well-being of their customers globally by delivering the highest quality, best value nutritional supplements and wellness products. NBTY has worked closely with Long Island Cares to support services for the homeless, expand children's nutrition services, donated thousands of backpacks filled with new school supplies, and sponsors the annual Concert for Children's Hunger Awareness. This year, NBTY partnered with Long Island Cares and the Long Island Ducks to sponsor the very first Hunger Awareness Day at Bethpage Ballpark to celebrate national Hunger Action Month. JEN CHAPIN and her BAND will be our musical guests this year performing songs from her latest album, Reckoning. Jen Chapin is the epitome of an artist-activist, touring and recording critically acclaimed albums, engaging in and passionately promoting the movement of food justice. Jen serves on the Board of Directors of Long Island Cares ally organization WHY Hunger, founded in 1975 by her father, Harry Chapin. She is active in the local sustainable food movement around her home in Brooklyn. Jen has also been involved with Long Island Cares by serving as the keynote speaker at their annual Government Affairs Breakfast and recently headlining a benefit concert to support their new South Shore Service Center in Lindenhurst. BEN SOMMONEAU our special guest M.C. is the popular co-anchor of Fox 5's Good Day Wake Up. He is the recipient of three Emmy Awards, an Edward R. Murrow Award for investigative reporting and a Walter Cronkite Award from USC for excellence in political journalism. Simmoneau also worked for Chris Matthews of MSNBC as a researcher on his bestselling book, American: Beyond Our Grandest Notions. Sponsorship Opportunities are available along with individual tickets and table reservations for this star-filled event. For information contact Robin Goldberg, Special Events Manager at: (631) 582-3663 or visit: www.licares.org. YOU CAN OWN A PIECE OF ROCK AND ROLL HISTORY BY ATTENDING THE HARRY CHAPIN HUMANITARIAN AWARDS DINNER TO BENEFIT LONG ISLAND CARES, INC. Among the many raffle and auction selections at this year's annual Harry Chapin Humanitarian Awards Dinner is a signed guitar by all four members of The Rolling Stones. The collectors item for any Rock and Roll guitar devotee has been donated to Long Island Cares by D'Addario and Company, the world leader in guitar strings for artists like The Rolling Stones. What better way to celebrate The Stones 50th Anniversary then by owning a piece of Rock and Roll history for a minimum bid of $10,000 with all proceeds supporting the work of Long Island Cares, Inc.
Subject: LongIsland.com - Your Name sent you Article details of "Long Island Cares, Inc. Announces 2013 Harry Chapin Humanitarian Awards Dinner"